Thule van tents give you a great outdoor living space on your campervan travels. Highly versatile and easy to install, they add a new dimension to life on the road. Universal and compact awning tent with an ultra-fast set up. 4.00m rail, glued on vehicle or awning to mount a Thule awning tent. Easier and faster to install than a traditional tent, a Thule campervan tent gives you exciting new possibilities on the road. There are a variety of solutions to suit the length of your travels and your own style – the awning can easily be used separately without an awning tent, and you can also customise the space under your awning to your needs. For easy and quick installation, your awning transforms to become the roof of your tent. 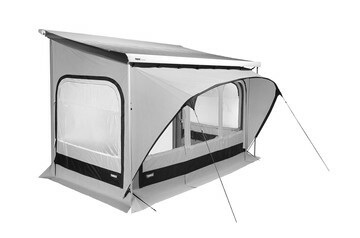 The tent consists of 3 panels: 2 sides and 1 front, all which connect to the awning. The side panels also connect to your vehicle for a perfect seal. And with the front panel sliding into the awning lead rail, you quickly create a room that is protected against the weather. These tents are in 1 piece and take little time to set up. 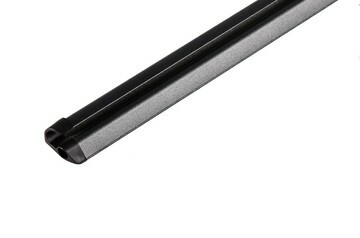 Slide it in an additional rail below your awning cassette and fix it to the awning lead rail. In this way, you can now enjoy a double roof, which offers great insulation from the sun to keep the tent and vehicle cool. Side windows are equipped with mosquito mesh. Depending on the awning tent type, Thule uses different durable high-quality fabric materials: Airtex, PVC or Ripstop that provide wind and water tightness. And just to be absolutely sure, all Thule awning tents are tested in various weather conditions to guarantee optimal stability and security. Each Thule van awning tent has a contemporary design in line with the awning. Thanks to the black, white, grey and silver neutral colours, it suits all awning fabrics. Large windows create maximum light and an extra feeling of spaciousness. The airiness is reinforced by permanent ventilation openings that also reduce condensation. The van awning tent can be installed completely, but thanks to the clever design, most of the panels are unzippable and removable to let you create door openings on different sides. You can also roll up the panels easily and separately, and even replace them with optional mosquito mesh panels to create extra ventilation and protection against insects.